Mark Hancock started teaching English in 1984 and has since worked in Sudan, Turkey, Britain, Brazil and Spain. He’s written books including Pronunciation Games (CUP 1995) and English Pronunciation in Use (2nd ed. CUP 2012). He is co-founder, with Annie McDonald, of the ELT resources site hancockmcdonald.com, where many pronunciation activities are freely available. Mark’s session was almost entirely practical with a range of very useful games to practise pronunciation. 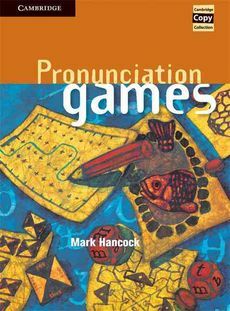 I won’t describe them here as you can find resources and notes on Mark’s website (link below) or in his fantastic book Pronunciation Games – my book of choice for pronunciation resources. It also interested me to hear that Mark is exploring the use of misheard lyrics in the EFL classroom, particularly as this is something that crossed my mind with my 1 to 1 pronunciation student, Tung, last summer, but didn’t develop further than a vague idea. Mark uses songs with ‘murdered lyrics’ to build students’ awareness of ambiguities and homophones (and again you can read more about that on his website).